Jan Ramesh De Saram uses his phone as a torch, casting a small circle of light at his feet as he walks down the corridor. The passage ends in darkness, where bats squeak and flap their wings. 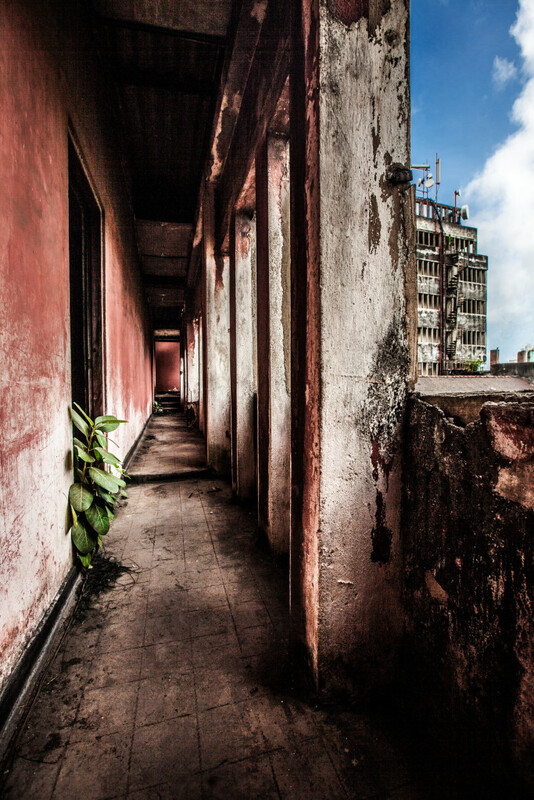 A row of abandoned rooms are occupied only by an upturned chair or two, lonely rejects from the cinemas below. Above us, the Rio Hotel continues its ascent, seven stories up. We take the stairs and, as we clear the rooflines of the surrounding buildings, light floods the structure. At the top a brisk wind breaks on our faces as we look out onto a city in the throes of transformation. On one side, a cluster of dark asbestos roofs, then the ugly sprawl of a construction site. Beyond that, the blue of the Indian Ocean under a midday sun. 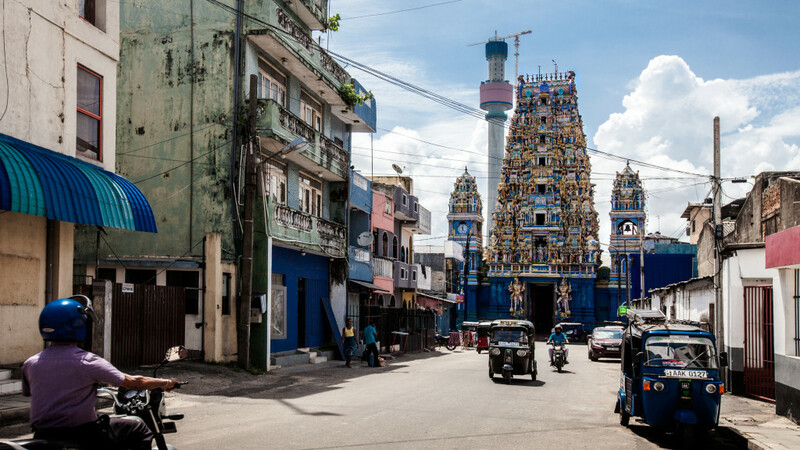 On the other side are more homes punctuated by the ornate gopuram of the Sri Subramaniya Kovil; dwarfed, in its turn, by the Lotus Tower, a controversial, unfinished construction project begun by a previous government. We are in the heart of Colombo, furious new development all around. “Every time I’m here, I think this building will be here for another five years, it might even be here for another 10, but I think it will eventually be replaced by something big,” he says. Since he first rediscovered the space in 2012, Jan has been one of its most determined champions. As the Cultural Affairs Coordinator at the Goethe-Institut in Colombo, he’s nudged theatre companies, art and music festivals in the direction of the Rio complex. Organisers have had their pick of two theatres (one abandoned, one not) and a derelict hotel with 60 rooms. There is something about this place that affects Jan, but he finds not everyone shares his enthusiasm for it. 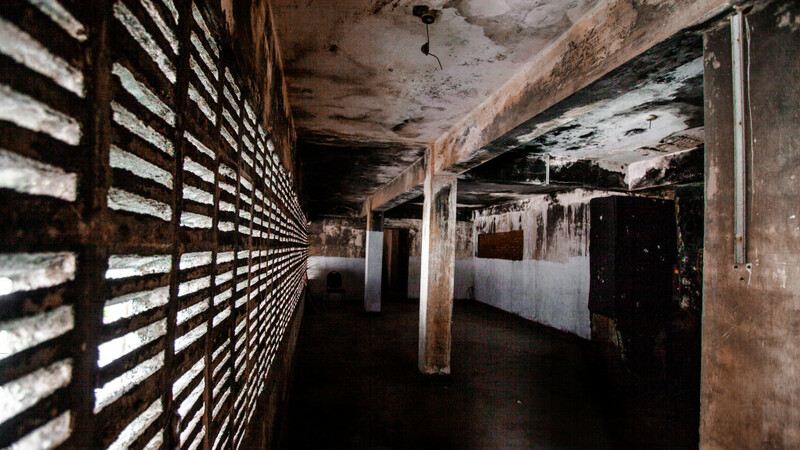 When they invited artists to come and explore it as a possible exhibition space, one said it looked more like a spot where junkies would go to shoot up. Last year, when Pettah Interchange brought a host of DJs into the city for a party here, a guest asked to be taken home. She said she saw ghostly figures wandering among the revellers, and felt afraid. Tuk-tuk drivers do a double take when you ask to be dropped off here – the Rio Cinema is itself infamous as the host of adult films, all outdated and on an endless rota of reruns. The adjoining Navah Cinema is gutted, the storage depot for a bottle shop out back. We peek in through a gap in a boarded up door, but Jan’s feeble torch cannot illuminate the interior of the vast space. It’s hard to believe this complex was once amongst the area’s best known landmarks. 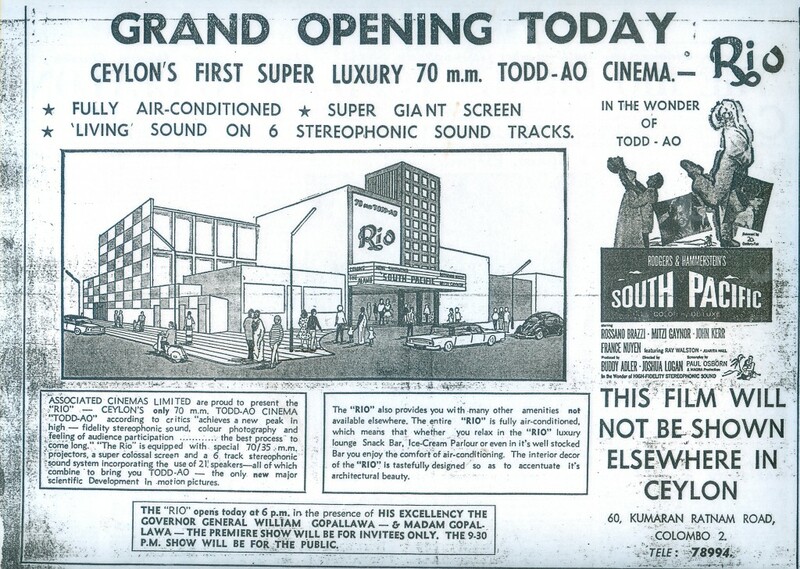 When the Rio opened its doors in 1965, it was to offer Sri Lankans their first sight of a 70mm TODD-AO projection system. In the audience on the opening night was a man only a month away from his fourth – and longest – stint as Prime Minister (Dudley Senanayake) and a young girl who would go on to become Sri Lanka’s President (Chandrika Bandaranaike Kumaratunga), 29 years later. In the years since, the complex has come close to demolition more than once. The family that owns it cannot decide what to do with it. Jan, on the other hand, is full of ideas. He imagined the space being turned into ‘a cultural entertainment initiative’ – part café, part gallery and part nightclub venue – and submitted this as a proposal to the owners. However, earlier today he was told they could not rent him the space. This Mr Navaratnam’s son is the man I meet, in a room behind the box office downstairs. His name is Ratnarajah Navaratnam, known to all as Thambi (meaning little brother, as he was the youngest of his siblings) and he was in Colombo in the July of 1983. His parents Navaratnam and Rukmani were in India, and he is glad they were not here when the mob came. He tells me his is a family with respectable antecedents. (On his mother’s side, his great-grandfather Sangarapillai was the founder of the Manipay Hindu College in Jaffna.) But his parents themselves were not rich to begin with. Thambi’s father, Navaratnam, lost his own father very young. His father had been a soldier in the British army and, when he died, Navaratnam was forced to leave school to support his family. He began to work in Colombo with his uncle Thambyah, the successful owner of the city’s first colour printing press. Navaratnam was by all accounts a remarkably enterprising and hardworking man. He made a success of the business, multiplied his investments and raised loans until he was able to build the Navah Cinema, whose construction he oversaw himself, without the help of an architect. It was a process he would repeat with both the Rio Cinema and Hotel. Navaratnam eventually became so experienced that he could, by instinct alone, instruct the builders on the proportions of sand, cement and water that had to go into the concrete mix. On nights when the builders worked all night, he stayed with them till sunrise. His children remember their father as pious and stern – “a traditional Jaffna father” – but being the sons of a successful cinema owner had its benefits. People affectionately dubbed the Rio the R-10, and for a while that was also what Thambi’s friends called him. He would write them little notes guaranteeing them free entrance into the theatre, but never so many that his father would notice. It seemed a space somehow protected from the rising ethnic tensions in other parts of the country. In 1956, less than a decade after Sri Lanka won its independence, Parliament passed what is commonly known as The Sinhala Only Act. Many argue that this Act, which made Sinhala the only language of administration, was a nationalistic act of revenge for British colonial ‘divide and rule’ policies. It had many repercussions, notably forcing thousands of Tamil civil servants to resign because they could not work in the Sinhala language. Island-wide ethnic riots broke out for the first time in 1958. Tamil lives and property became the targets of Sinhalese mobs in the South and there were occasional retaliatory attacks on Sinhalese targets in the north and east. As a precaution during that time, Navaratnam uprooted his young family and moved back to the relative safety of Jaffna (a traditionally Tamil majority area) for two months. When they returned, everything seemed as before. In any case, when something did happen, there was no political protection to be had. The first Thambi heard of it was that the separatist Liberation Tigers of Tamil Eelam had ambushed and killed 13 soldiers in the north of the country. The very next day, a heated controversy around the return of the soldiers’ bodies sparked a week of deadly rioting around the country and particularly in Colombo. Mainly Sinhalese mobs began to operate, seeking out Tamil homes and businesses to attack. Not long after that, the mob arrived at the doors of the Rio. Premadasa’s is the Rio’s oldest employee, and though he now works at another cinema in the city, he still has a space to live on the premises with his family. Premadasa’s home is accessible through the parking garage at the Rio. He is, as he always was, the consummate odd job man. He can turn his hand to many things, from running the box office to cleaning the popcorn machine, even managing basic accounts when called upon. 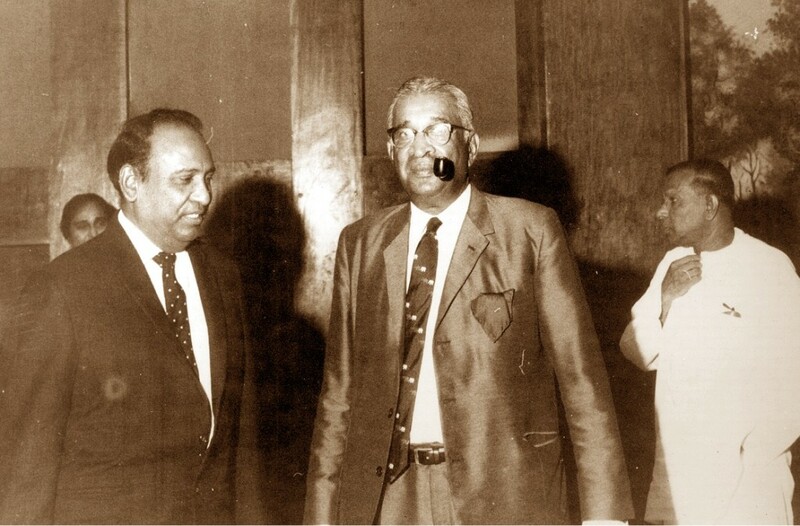 Premadasa’s assessment of Navaratnam is quite similar to that of Navaratnam’s children – that he was strict but fair. Now 63, Premadasa was a young man when he first entered Navaratnam’s service, earning some five rupees a day for the film posters he would paste in various parts of the city. He was soon promoted to being a hall attendant, responsible for seating 600 people at a time. He remembers the Rio was among the most successful cinemas in the city – many shows were sold out, even the balcony where a ticket cost Rs 3.20. On the day of the riot, Premadasa was on the property. He recalls that the rioters who came to the Rio were a mixed group, of Sinhalese people and Tamil-speaking Muslims as well. The mob was intent on stripping the property bare: they spent much of the day robbing the luxurious hotel of its furnishings and equipment and then, around sundown, set what remained on fire. Thambi and his family had taken shelter at an upscale hotel close by, hoping the presence of tourists would give the authorities the motivation to fight off any mob. But they could see the smoke spiral into the sky from where the cinema stood. Premadasa himself hid in the Navah, where he says the looters found him and stole his savings – some three to four hundred rupees. His life itself was likely spared because, as the son of a Tamil father and a Sinhala mother, he could speak both languages fluently. Across the rest of the city, the attacks devastated homes, businesses and lives. Victims would say later that the organised mobs that arrived at their doorsteps were directed there by sheets of electoral registers. Among the Sinhala majority, conscience dictated choices – some were marauders, but friends and neighbours also stepped in to hide and defend their Tamil compatriots. Some 150,000 people are believed to have been made homeless, and the death count is disputed – various estimates place it anywhere between 400 and 3000 people. Black July, as it would later be known, is taken to mark the beginning of a civil war between Tamil militants and the government of Sri Lanka that lasted nearly 30 years. It also drove an exodus, as a great number of Tamils left Sri Lanka for the shores of other countries. Premadasa remembers old Mr. Navaratnam’s return from India a few days later: on seeing what had happened to his life’s work, he broke down and cried bitterly. Soon after that, he fell ill. In 1984, the family emigrated to Australia. Navaratnam never returned to Kompannaveediya or to Sri Lanka. As he lay dying, Thambi says his father seemed immensely vulnerable. So distant before, he would now ask his children to sit by his side and simply hold his hand. Today, the future of the Rio, indeed of the whole of Kompannaveediya, is uncertain. Much of the area was marked for a controversial ‘beautification’ drive under the recent Rajapaksa government, who brought the Urban Development Authority (UDA) under the purview of the Ministry of Defence (MoD). Three rounds of evictions had already been carried out in the area, but after elections in January made Maithripala Sirisena President, the UDA was de-linked from the MoD and all its development projects put under review. It’s easy to see why this space is so contested. It is in a high security zone, bordered by luxurious hotel properties and government sites critical to national security – both the Ministry of Defence and the Air Force Headquarters are here. This is also one of the closest residential neighbourhoods to the bustling financial centre of the Fort. Just across the road from the Rio is the Sri Subramaniya Kovil, a major Hindu temple, and a few doors down from there you will find Aslam Othman at the Federation of Kompannaveediya Masjids (FKM), where he serves as a Propaganda Secretary. 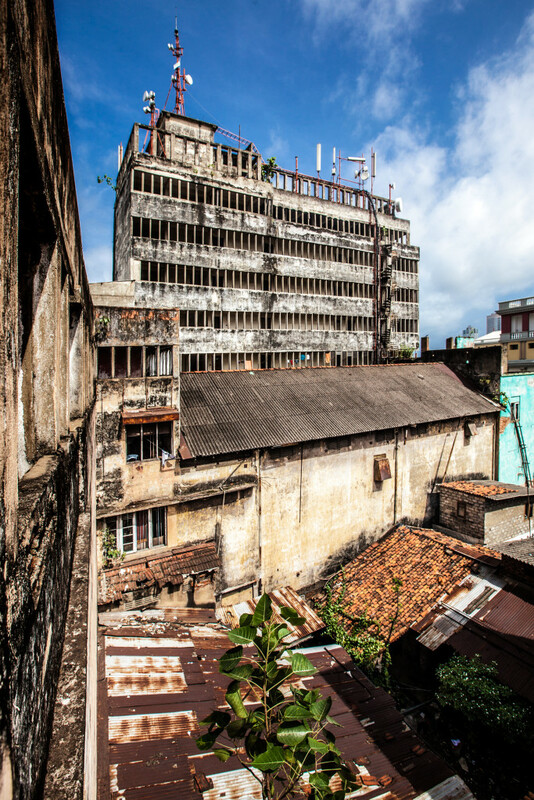 The group have taken the fight against evictions to Sri Lanka’s Supreme Court more than once, and wait with some trepidation to see what the area’s fate will be. In the meantime, there is much confusion over deeds, financial compensation and the allocation of new housing. According to a report by the Centre for Policy Alternatives (CPA) published in April 2014, the number of families to be relocated over the next few years under the city’s Urban Regeneration Project is between 70, 000 and 135, 000 – again estimates vary widely. Aslam’s family have lived in this area for a hundred years. To him the place is a microcosm of Sri Lankan secularity. “We have 10 mosques here …four Buddhist temples, a Hindu kovil beautiful enough to be a tourist attraction and many other individual Hindu statues located in this area.” This neighbourhood, with its dense little labyrinth of streets is full of homes built on a single perch (about 25m2) of land. Some of these now host two or three families in an incredibly confined space. Yet, this contributes to a strong feeling of community, as much socialising is accomplished on the streets and on the stoops of homes. The land that was cleared of houses is now in the process of being built up. One space in particular, the enormous Cinnamon Life project, has the potential to dramatically alter the view from the Rio. When it is complete, the Indian Ocean will no longer be visible from the Eagle’s Nest. In August 2015, a festival called ColomboScope will be the latest to make use of the Rio. Curators have planned an ambitious exhibition. ‘Shadow Scenes’ will allocate hotel rooms to a group of local and international artists for installations and exhibitions. The project is a reflection of Jan’s original inspiration – as a teenager growing up in Berlin, he remembers a movement that saw artists and intellectuals find new uses for the decrepit and abandoned buildings of East Germany. Now, the hotel is being made as structurally sound as possible, but organisers nevertheless intend to restrict the number of people who enter and where they can wander. 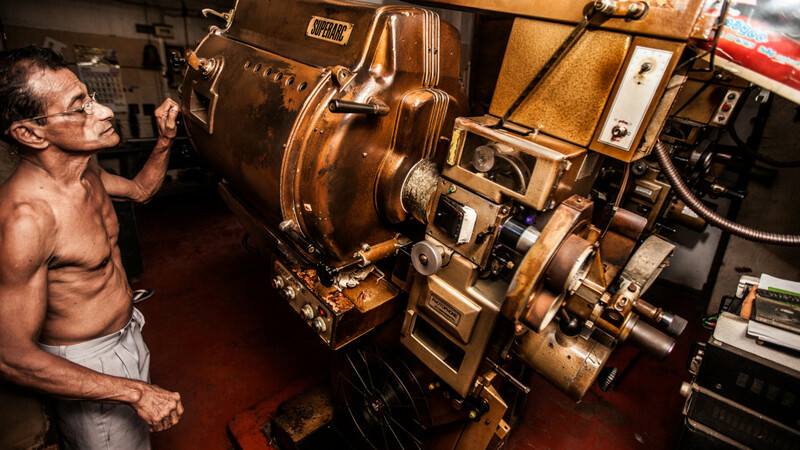 There are also plans for a film that will touch on the history of the area and the cinema. Consequently, Premadasa has been approached more than once by people asking to hear his story. He cannot entirely fathom the recent interest in the theatre and the hotel as they are now, stripped of the grandeur he remembers so well. He is sad when he thinks about the past, but philosophical about what the future holds for the Rio. “Everything is like this in the world,” he says, “it comes and it goes. On my last visit, Thambi is at the back of the cinema, meeting with suppliers of air-conditioning – as the city sweats in the throes of a heat wave, he thinks it’s about time to reinstall it at the Rio. He confesses that his heart is not with the hotel but with the cinema. He was born the year his father opened the doors of the Navah and has loved movies all his life. Published on Commonwealth Writers on July 15, 2015. Words by Smriti Daniel. Pix by Suda Shanmugaraja.